Late leaf rust is a potentially serious disease of red raspberries. Late leaf rust does not affect black raspberries or blackberries. The disease can affect leaves, canes, petioles and fruit. Economic losses occur from fruit infection and premature defoliation. Because it usually appears late in the season, and only occasionally in a severe form, some consider it to be a minor disease. However, losses due to fruit infection have reached 30 percent in commercial red raspberry plantings in Ohio. The wild red raspberry, Rubus strigosus, in the eastern United States is very susceptible to this disease. A number of cultivated varieties originating from this species also are highly susceptible. While late leaf rust occurs throughout the northern half of the United States and southern Canada, it is more common east of the Mississippi River. In recent years, its occurrence has increased in the northern areas of the Midwest, and it has caused significant losses. Figure 1. Early season symptoms of late leaf rust on infected red raspberry leaf. Note the chlorotic, or yellow, areas on the upper surface of the leaf. 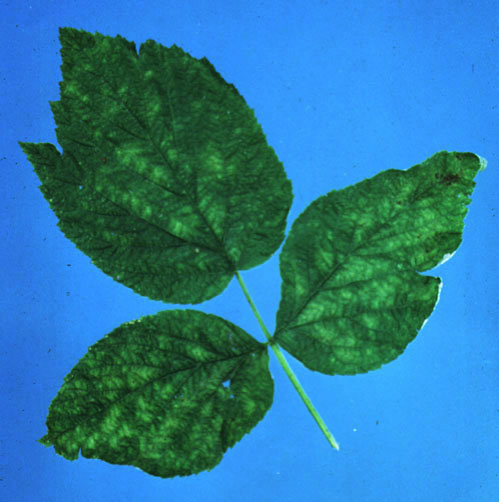 On mature leaves, small chlorotic, or yellow, areas initially form on the upper surface of infected leaves (Figure 1). These spots may eventually turn brown before leaves die in the fall. Unless the disease is severe, foliar infections may be difficult to see. 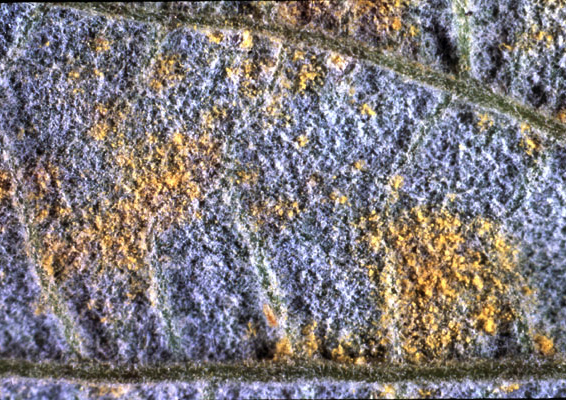 Small pustules filled with yellow to orange powdery spores (not waxy like the spores of orange rust) are formed on the underside of infected leaves (Figure 2). Badly infected leaves may drop prematurely, and in years when the disease is severe, canes may be bare by September. Flower calyces, petioles, and fruit at all stages of development may be attacked (Figure 3). 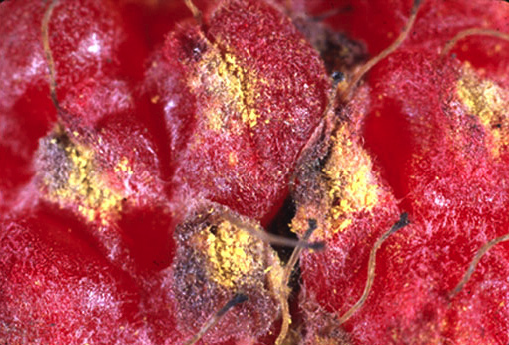 On fruit, pustules develop on individual drupelets, producing yellow masses of spores (Figure 4), which make the berries unattractive and unacceptable for fresh market sales. Infections may also occur on leaf petioles and canes. Late leaf rust is caused by the fungus Pucciniastrum americanum. Unlike the fungus that causes orange rust (a common disease on black raspberry and blackberry), the late leaf rust fungus is not systemic. The fungus is heteroecious, meaning that it attacks two different hosts at different stages of its life cycle. The rust fungus produces two types of spores (urediniospores and teliospores) only on red raspberries. The alternate host for the rust is white spruce (Picea americanum), on which another type of spore (aeciospore) is produced. Figure 2. Small pustules filled with yellow powdery spores on the underside of an infected red raspberry leaf. Aeciospores are released from infected white spruce in mid-June to early July and are capable of infecting raspberry during this period. In early July, urediniospores (powdery-yellow to orange spores) start to form on the underside of infected raspberry leaves or flower parts. These urediniospores can continue to cause infections on raspberry leaves and fruit throughout the growing season. Another type of spore (teliospore) develops on infected leaves in the fall and serves as the overwintering form of the fungus. In the following year, the teliospores germinate and form yet another type of spore (basidiospore), which infects white spruce needles during rainy periods from mid-May to early June. Several recent studies indicate that the fungus apparently does not need the aeciospore stage to survive on raspberries, because the disease is found year after year in regions remote from any spruce trees. It is probable that the fungus overwinters on infected raspberry canes as urediniospores or teliospores that serve as the source of primary inoculum for new infections the following season. Figure 3. Late leaf rust symptoms on red raspberry fruit. Note the pustules on individual drupelets. Figure 4. Pustules on individual drupelets on infected fruit. Note the masses of yellow spores. Use healthy, disease-free planting stock. One of the best ways to avoid the disease is to start the planting with healthy planting stock. Since the fungus can be carried in or on planting material, inspection of the planting materials before planting is recommended. Site selection. Select a site with good air movement and full sun exposure. Never plant raspberries in shaded areas. Good air movement and sunlight help the foliage and fruit to dry off quickly after a rain or heavy dew. Rapid drying will reduce the incidence of fruit and leaf diseases in general. Canopy management. Keep row width between 1 and 2 feet in order to encourage air movement and faster drying. Cane density should not exceed three or four canes per square foot. Always select large, healthy canes when thinning. Control timing and the amount of nitrogen fertilizer to prevent excessive growth. Control weeds. Good weed control within and between the rows is essential. Weeds in the planting prevent air circulation and increase drying time, resulting in wet fruit and foliage for longer periods. Sanitation. Remove and destroy infected and old fruited canes. Previously infected plant parts serve as a source of inoculum for the disease. Removing and destroying old fruited and infected primo canes greatly reduces the amount of disease inoculum in the planting. Eradication of alternative and wild hosts. As previously mentioned, the late leaf rust fungus requires white spruce trees as an alternate host to complete its full life cycle. Eradication of white spruce trees interrupts the life cycle of the fungus and should aid in disease control. Eradication of nearby wild red raspberries that serve as a reservoir for disease is also beneficial for control of the disease. Use of disease resistance. Black raspberries and blackberries are immune to the disease. 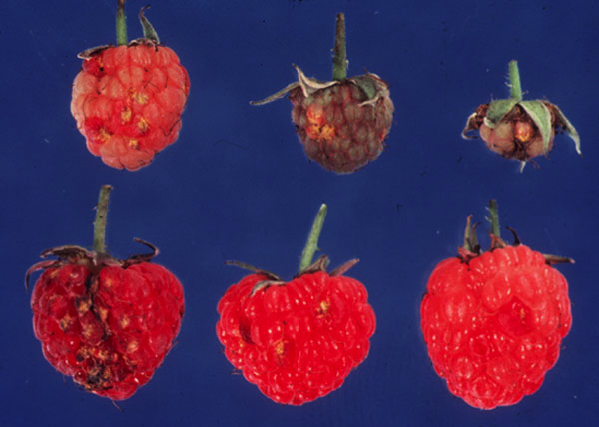 Unfortunately, there are no commonly grown red raspberry varieties that are resistant to the disease. Fungicide use. Fungicides that are effective for control of late leaf rust are currently available and are commonly used in commercial plantings.